This product is no longer available and has been replaced by: RF411A. The RF431 spread-spectrum radio includes a USB port to make it easier to connect to newer computers that do not have RS-232 ports. This 100-mW spread-spectrum radio/modem operates in the 920- to 928-MHz frequency range, which is allocated for Australia/Israel. The RF431 can transmit data to another RF431 radio, an RF411 radio, or CR211(X) datalogger. The RF431 supports point-to-point and point-to-multipoint communications. Although it typically serves as a base station modem/radio, the RF430 can connect to the datalogger’s RS-232 port to serve as a field modem (requires a null modem cable and a field power cable). Faster communication due to elimination of some small "link state packets"
Reduced power consumption by the data logger, as the radios perform "packet address filtering"
The RF401-series and RF430-series spread-spectrum radios are similar. The models in these two series differ in their ports used for connecting to computers/data loggers, in their frequencies, and in their transmitting power. Refer to the following table for specifics. The RF431 reduces susceptibility to RF interference from other spread spectrum devices by providing user-selectable frequency hopping patterns. Spread spectrum radios spread the normally narrowband information signal over a relatively wide band of frequencies. This process allows communications to be more immune to noise and interference from RF sources such as pagers and cellular phones. The RF431 radio is functionally the same as the RF411. The difference between the two is that the RF431 has USB and RS-232 ports, while the RF411 has RS-232 and CS I/O ports. If an RF431 radio has an operating system prior to OS2, its USB port will only communicate at 38.4 kbps. Therefore, the operating system of an RF431 radio may need to be updated to a newer version if the network will contain data loggers that do not support 38.4 kbps (e.g., CR200(X), CR510, CR10X). The push button that allows you to check/edit programmable settings while the radio is connected to a computer may not operate at temperatures colder than -25°C. CR9000 (retired) Although compatible, RF431 radios do not support the CR9000(X)'s fastest communication rates, and are therefore not practical for many of their applications. CR9000X Although compatible, RF431 radios do not support the CR9000(X)'s fastest communication rates, and are therefore not practical for many of their applications. 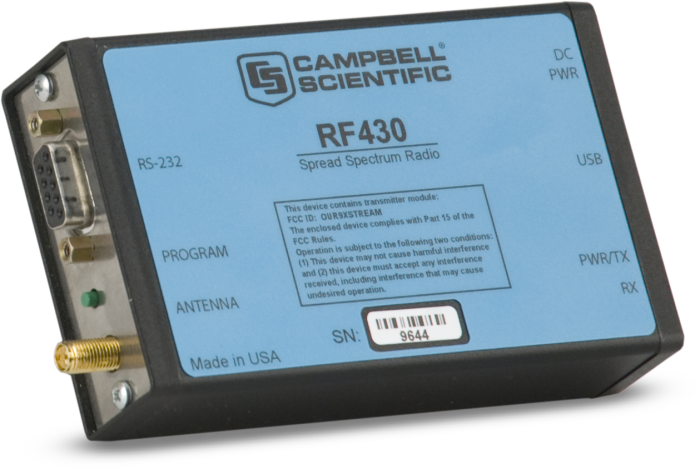 Campbell Scientific does not recommend using the RF431 in networks containing FGR-115 or RF450 radios. However, RF431 radios can be used in networks containing RF411 and RF410 radios. RF431 radios in networks that include RF410 radios must use the Transparent protocol setting. Also, If RF410 and RF431 radios will be in the same RF proximity, do not use for the RF410 Net Address: 28, 44, 52, 56, or 60. RF410 radios with Net Addresses of 28, 44, 52, and 56 interfere with RF431 radios with Net Addresses of 0, 1, 2, and 3, respectively. The RF410 Net Address of 60 interferes with all RF431 Net Addresses. Do not mix RF431 radios set to the Transparent protocol with RF431 or RF411 radios set to either of the PakBus protocols, since this will produce RF traffic without any RF communications. However radios with the PakBus Aware and PakBus Node settings can coexist in the same network (i.e., some radios set to PakBus Aware and some radios set to PakBus Node). RF430 USB Drivers for the Windows operating system. 32 and 64 bit support for Windows 8, Windows 7, Windows Vista and Windows XP. Note: Drivers should be loaded before plugging the RF430 into the computer. How can the driver for an RF430-series radio be downloaded? Download the RF430 driver from the Downloads page. What criteria should be used to select an antenna? Consider how many stations a particular station needs to communicate with. For remote stations in communication with only one repeater or base station, a directional or Yagi antenna may be an appropriate choice. In contrast, repeater stations that receive data from many different locations will probably require an omnidirectional antenna. Consider if a high-gain antenna is needed to overcome the path between two points. Higher-gain antennas are larger and more expensive. To help with antenna selection and site placement, consider renting and using a demo kit to test the pathway quality. Campbell Scientific offers a 900 MHz demo kit for the RF401, RF430, CR206X, and AVW206, as well as a demo kit for the RF450. Contact Campbell Scientific for assistance.